There are strong indications that a lot Nigerian electorate may not be able to participate in electing the president and representatives at the National Assembly on Saturday, February 16. Checks conducted by Realnews on Thursday, February 7 ahead of the initial deadline of Friday, February 8 for the collection of the permanent voter cards, PVC, revealed that PVC collection centres were still playing host to mammoth crowds, struggling to collect their cards so as to vote in the coming elections. For instance, at Ikeja Local Government INEC office at about 3:00 pm revealed a rowdy gathering of despondent Nigerians, most of whom had been at the collection point all day in a bid to collect their PVCs. “I have been here since morning; I don’t understand what is going on,” Yinka Adeniyi, who had come from Ojodu to collect his card, lamented. Answering question on why he had to wait till the last hour before coming to collect his card, Adeniyi said he had been too busy to make out time for that. There were so many persons like Adeniyi at the centre, whose only reason for not having their cards just few days to the beginning of the general elections was procrastination. Beside that there were those who were asked to come back when their initial checks showed that their PVCs were yet to be delivered from Abuja headquarters. However, Doris Okoro, represents another category of people who were yet to pick their PVCs. Okoro did a transfer of PVC from Port Harcourt to Lagos and that is why she was yet to collect her card. “I don’t think these ones have anybody’s time; I’ve tried to offer money to facilitate the collection of my card, but they did not listen to me,” another prospective voter, who refused to say his name, said. He was responding a question on whether the delay was being caused by officials trying to exploit people’s desperation to make money. Our team observed that prospective voters were asked to submit their temporary voter cards, TVCs, zone by zone to make it easier for the PVC to be sorted out. There were, however, cases of people submitting their TVCs in wrong places, thereby increasing the work load of officials, who not only had to identify the wrongly submitted ones but also announced the names on them to draw the attention of their owners. At that point some people left, vowing not to return to collect their cards again. Some left without uttering a word. Yet, others remained to see if there could be a way around it. Indeed, there have been complaints by Nigerians over the difficulties they encountered in trying to collect their PVCs. Officials of the INEC, in many states have also complained that hundreds of thousands of PVCs were still to be collected. The assertion was corroborated by opposition Peoples Democratic Party, PDP, on Wednesday, February 6, when it complained that many Nigerians were yet to collect their PVCs and urged the INEC to extend the deadline for the collection of the cards. This, perhaps, prompted the INEC to extend the collection of the PVC to Monday February 11. Even then, some observers said the extension does not guarantee that all those who are yet to collect their cards will succeed in getting them. However, the INEC in Lagos had on Wednesday, February 6, disclosed that more than 5.5 million PVCs had been collected by registered voters in the state. 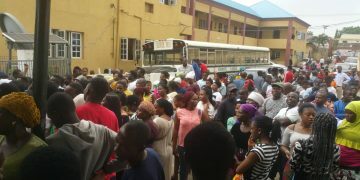 Femi Akinbiyi, the INEC public relations officer in Lagos State, who disclosed this in an interview with the News Agency of Nigeria, NAN, in Lagos, revealed that the number of registered voters in the state stood at 6, 566,136 and urged those yet to pick up their cards to do so before it would be too late. “There are still so many PVCs yet to be collected at the INEC offices in the 20 local government areas of the state. “We are also appealing to all registered voters who are yet to pick up their PVCs to do so before it will be too late for the 2019 general elections. “Ample opportunities have been given to all eligible voters who registered for PVCs to collect them. I want to urge the people to create time to collect their cards,” Akinbiyi said. Announcing the extension of PVC collection deadline on Friday, February 8, Mahmood Yakubu, the INEC chairman, said the commission was also taking urgent steps to address complaints of unavailability of the PVCs of some registered voters before the end of the deadline for the collection. “We wish to reiterate that after the deadline of Monday, all uncollected PVCs will be recalled and deposited with the Central Bank of Nigeria, CBN, for safe-keeping until after the general elections when the collection of cards and the continuous registration of voters will resume,” Yakubu said.